Uh, has anyone considered making a proper Touhou series thread? This OP isn't exactly informative. Eh, I don't really think there's enough of an audience that it needs its own thread. A general shmup thread might be ok though, if there isn't one already. I don't think there is, hasn't been in ages anyway. A proper Touhou series thread might get more people into the series. Cleared. Four deaths, two against stage 2's boss. Not bad all things considered. I like the title screen music, the rest, meh. Nice UI updates. I don't get the new gameplay mechanics. So far, UFO was better. And what's with the random cameos? 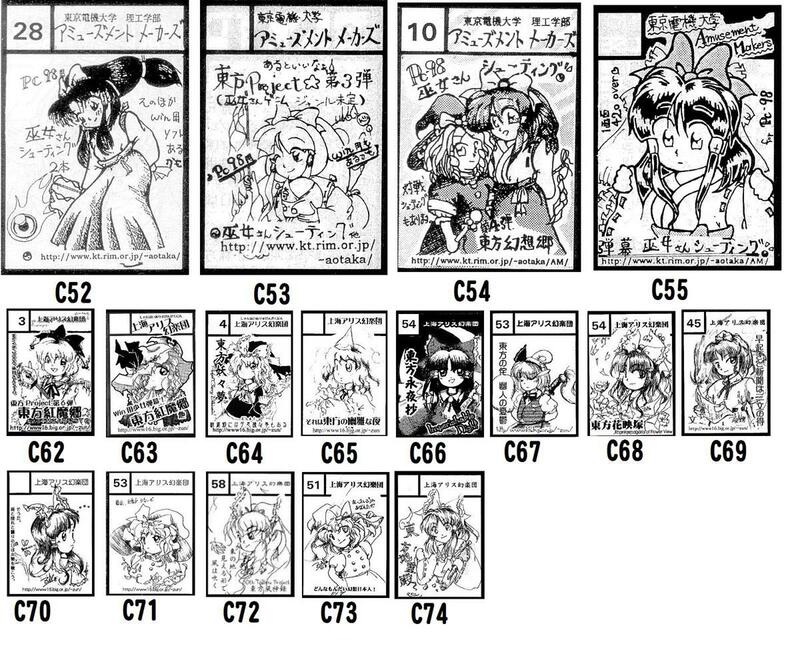 It's like Touhou Greatest Hits. Do you really want to introduce people to a series that spawned a bloody empire of fan-everything? Seriously, my youtube account is my chastity belt. I pretty much need two youtube accounts because of Touhou. And I don't mind ZUN's art. I think it was best in IN. I like that he keeps his designs clean-cut. Hmm....Youmu new special attack may top Marissa love color master spark for 'most awesome special attack' award. I wouldn't mind a Touhou or shump thread if we got leaderboards. Just did my first playthrough. Used Reimu 0 deaths, captured every spellcard except the 3rd stage bosses first spell which I timed out(anyone else felt the timer on her was really short?) and only used 1 bomb which was when I hit X instead of C by mistake. I need to get used to this game gimmick more though. I might be able whip up a Google spreadsheet for each with the top 10 scores for each difficulty getting mentioned in the actual OP. I'am just lazy and don't want to make the actual thread and since I can't read Japanese I would be stuck waiting for people to translate new stuff for the thread. Edit: A spreadsheet leaderboard is doable it just won't look fancy and to prevent people from trolling and deleting the entire thing editing rights would be restricted. Zun's art has become halfway decent in recent games. PCB was good (based on what I expect from his art), it went downhill for every release after that until UFO, which was a marked improvement. As for Ten Desires, It Got Worse. Eh, the main Touhou forum does one. There's also the English replay tracker which lets you sort by score and game, and the Japanese score board with links to replays. Royalflare has a few sorting options depending on the game, like overall score, score by difficulty, score by difficulty and character, etc. What. OK, it's not that great, but Ten Desires has the best pictures he's done. Half the time ZUN draws zombies in frilly dresses. So I was trying a Youmu playthrough using just her sword attack and I found out some fun things about that annoying can't advance through text glitch you can't use bombs or trance(guess that what it is called) but you do time out of the bosses first non-spell attack. I think it is caused by holding Ctrl before the text appears. I'm working on an updated thread. I guess it's best I just do a broad outline of Touhou and maybe offer details on other key doujin titles? Or shmups in general? Heck, I might even show Umineko some love.